After having spent few miserable rainy days in the fishermens village near Landmannalaugar, we lost patience and decided to cross the island to try our chances in the north. The journey itself turned into much more adventurous event than what we expected, with rough rocky roads, deep and wild river crossings and endless lava fields to go through. 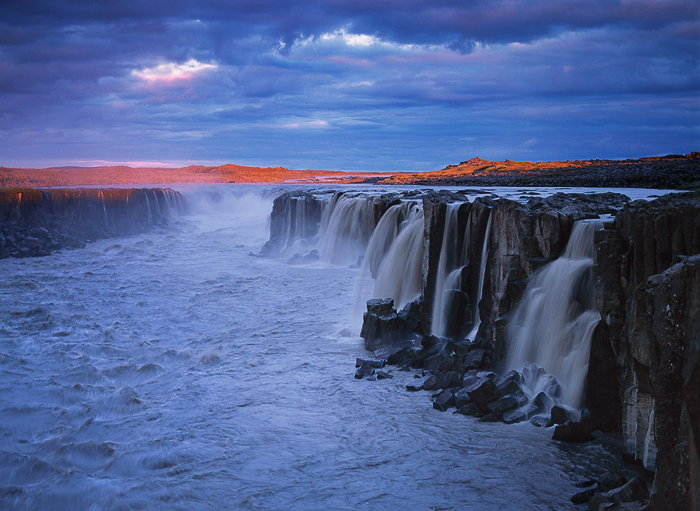 The destination was surely worth the hassle, two beautiful and loud waterfalls Selfoss and Detifoss suddenly put us on a bright side of the hell. But we were stupid enough to underestimate the pace with which the natural powers change the stage we're living on. Leaving our equipment behind, we missed perhaps the most spectacular light performance I witnessed on Iceland - the sun somehow got through thick clouds to illuminate parts of the scene and to create the stunning rainbow. We came back prepared the next night in hopes for something similar. No rainbow this time but luckily, we could enjoy our happy hour after so many days. Our beloved sun did it somehow again.